My interest in art stemmed from early childhood readings. Books are one of my primary sources for images, from early fairy stories to folk tales from a variety of cultures. While Brothers Grimm and Hans Christian Andersen were my original bed-time stories, I later discovered the tales of Russian collectors like Afanasyev and Norwegians Jorgen Moe and Peter Asbjornsen. Many other stories have been passed down and changed from culture to culture. 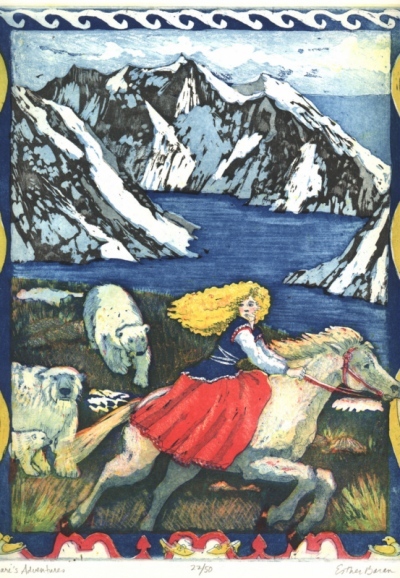 My favorite is the Icelandic story of a young girl whose adventures are much like those of Cinderella, but in this version she rejects the prince as being too superficial, having only noticed her in her finery and gold slippers. In most of the cultures I have explored, animals play central roles in the stories. Some cultures have animals representing deities, and in some they are comical characters whose behavior mimics humans. Some of the Native American tales use ravens, coyotes, or turtles to explain the origins of the world. Some African cultures have the spider, Ananzi, outwitting Tortoise, or the reverse. The possibilities for imagery are endless. Researching each country's history and unique characteristics is part of my enjoyment in doing the piece. I like to incorporate the fabric patterns and ornamentation from each ethnic group in borders around the images. I have used the same techniques in illustrating children's books. I have been doing color etchings for many years, but I have added watercolors as a more direct form of expression. In both media I also do landscapes as well as still lifes of fruits and vegetables.